Liddell Water is a river running through southern Scotland and northern England, for much of its course forming the border between the two countries, and was formerly one of the boundaries of the Debatable Lands. Liddell Water's source is beneath Peel Fell in Roxburgshire, in the Scottish Borders, where it is formed by the confluence of Caddroun Burn, Wormscleuch Burn and Peel Burn (burn is the Scots term for a stream). Soon afterwards, the nascent Liddell Water is fed by Dawston Burn near the village of Saughtree. 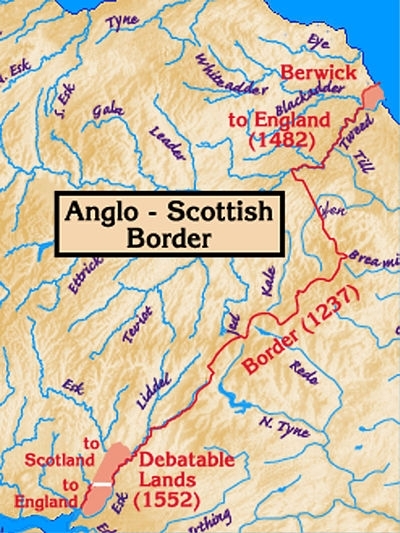 The river continues to pick up tributaries as it follows its southwesterly course, which takes it through the village of Newcastleton (also known as Copshaw Holm) to that of Kershopefoot, where the burn begins to mark the Anglo-Scottish border. Liddell Waters then flows into the River Esk at Willow Pool, beneath the former timber castle at Liddell Strength near Carwinley, Cumbria.